While construction professionals are skilled in the technical side of their work, they often find the financial management aspect of the business daunting. 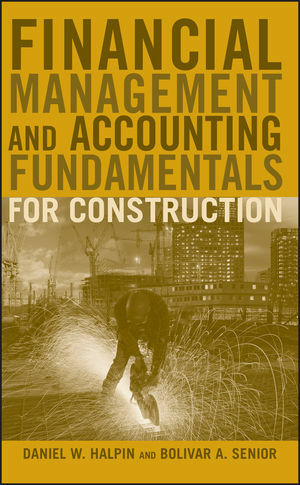 Financial Management and Accounting Fundamentals for Construction will help you better understand and navigate the financial decisions that are part of every construction project. DANIEL W. HALPIN is Professor Emeritus and former head of the Division of Construction Engineering and Management at Purdue University. The author of more than ten books, he is a member of the National Academy of Construction, a recipient of ASCE's Peurifoy Construction Research Award and the Carroll H. Dunn Award of Excellence from the Construction Industry Institute (CII). BOLIVAR A. SENIOR is an Associate Professor in the Department of Construction Management at Colorado State University. He has extensive professional experience in the management of construction projects. Dr. Senior has published many articles relating to construction financing as well as time planning and control. He is a member of the American Society of Civil Engineers and the Dominican College of Professional Engineers, Architects and Surveyors.